"The Big Picture" examines climate change the day after the Joplin tornado; what about the March 2, 2012 outbreak? 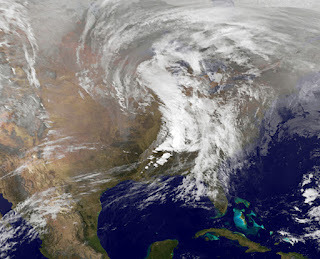 "The Big Picture" by Thom Hartmann (link), on May 23, 2011, looks at global warming (or climate change), on the heels of the horrific EF5 tornado multiple vortex outbreak in Joplin Mo. May 22. I pulled up this YouTube video today to see what has been put out there about the relationship between climate change and huge tornado outbreaks, particularly in early Spring, as have happened twice this week. Mr. Hartmann’s approach is very similar to “Professor” Al Gore’s in Gore’s film “An Inconvenient Truth”, from Paramount Vantage in 2005, and it's a bit of a college lecture. (Gore’s movie was almost the last film that my late mother saw before her passing in 2010. ) Hartmann uses timeline graphs (I don’t mean Facebook timeline here), to show how the world’s carbon dioxide levels were below 350 for all of history until the 1980s, and now are around 400. A level this high persistently means that the ecosystem of the Earth will change permanently, in a way that humans are not adapted to. He says that the city of Chicago no longer plants certain trees that it believes will be affected by a warmer climate, and that Chicago expects to have a Gulf like climate within a half century. He also criticizes the denial in the Republican Party, and says that conservative think tanks and oil companies have hired bloggers specifically to spin their denial. I would never accept payment to write someone else’s false stories to support their agenda. He mentions the movie "The Good, The Bad and the Ugly" in discussion politicians' approaches to climate change. The global warming portion of this broadcast takes the first 13 minutes, and also includes comments on Japan’s progress in solar energy. The storms on March 2, 2012 did lessen in severity as they approached the mid-Atlantic states, partly because colder air was dammed up against the Blue Ridge, and partly because the most severe part of the squall line had to cross the highest part of the Allegheny Front in WVa, often over 4500 feet. On the Weather Channel, I watched a severe squall line around Spruce Knob W Va die as it crested the Eastern Divide and become much less severe as it moved toward DC. Later in the Spring the DC area would have been more exposed. Mountains do protect the Washington and Baltimore areas somewhat, but not the Virginia and lower Maryland or Delaware tidewaters, where storms are usually more severe. Will this Spring be the worst ever? Could long-tracking tornados occur in the mid-Atlantic states and major cities the way they do in the Midwest? Or will the tornado season “end” sooner and mid-summer drought begin earlier? Remember, this year we had no winter in most of the US, but Europe had the worst ever. The jet stream, under La Nina, moved north over the Americas but south over Eurasia. There have been other years with mild winters in the East but cold springs. In 1957-1958 we had a mild January but huge storms Feb. 14 and March 20. In 1959-1960, when I was a junior in high school, we had “three white Wednesdays” with school closings in northern VA in March after a mild winter. On April 20, 1961, the day of a Senior class hike, we had the latest snow ever, one inch. In 1990 we had a very mild January, February, and early March, but had two 2-inch snows after the first official day of Spring. In 1992-1993 we had a mild winter, which started to deteriorate in late February with two or three little snows, and then we had the Blizzard of 1993, on March 13. That storm was similar to the outbreak yesterday but about 100 miles farther East. Had yesterday’s low tracked much farther East, there would have occurred an East Coast blizzard instead of a tornado outbreak. The biggest East Coast blizzard ever occurred in New York City in March of 1988, but that was before climate change. But it came suddenly after unusually mild weather. In 1998, when I was living in Minneapolis, we had a tornado outbreak in Minnesota on March 30. I had been up north with a friend that Sunday and came back through sleet before encountering the heavy storms. Wikipedia attribution link for NOAA picture of Jan 22-23 outbreak.